Today in my mailbox there was something I expected – an envelope containing the notebooks I’d ordered from Field Notes, in their new autumn colors, and a book: Dandelion: the Extraordinary Life of a Misfit. I don’t remember if I agreed to review the book, or asked for it in some other fashion, but it’s signed by the author, one Sheelagh Mawe, and it looks delightful, and having just finished reading The Lost Symbol, by Dan Brown, it’s nice to look forward to something a bit less intense. And yet, it’s also a total surprise, because while the title and author are striking a familiar chord with me, I’ve no idea where the book came from, other than, you know, FROM the author. It’s the kind of book meant to be read by the light of a single soft sconce, while sipping tea, and after a day of barking dogs and giant vacuums, it’s just the kind of book I need. Before Janine Talty became a doctor, her life wasn’t exactly a downtown Disney hotel. A social misfit, dyslexic to the point of being almost aphasic, and the recipient of several metaphysical gifts, like being able to communicate telepathically with her father, and certain others, and a preternatural way with animals and humans in need of care, hers was not a story I thought I would enjoy. I am more pleased than you could possibly imagine to be able to say I was wrong. From the moment I finished the first two pages of Indigo Awakening, I was hooked. It helped that Talty grew up in places I’m familiar with – she went to high school in the town where I learned to be a barista, for example, and frequented the same beaches I used to, in Santa Cruz and Capitola. What grabbed me, however, was the simplicity of her narrative style, and the complexity of her journey. Talty begins each chapter with advice to other indigos – children and adults who have similar gifts, and who tend to display a lot of indigo in their auras – children and adults who feel they’ve been put on earth to serve a purpose, to help and guide – even if – like her – they aren’t entirely certain what that purpose is. After the advice, each section tells of one part of her life, and she doesn’t hold her punches. She’s candid about the pain she endured (unbeknownst to her parents) in elementary school, but she also shares her delight when she solves a problem with a rescued animal, figuring out, for example, how to feed a bird with a severe neck wound. Describing this book is impossible. It’s memoir, yes, and spiritual journal, but it’s also a lesson from someone who has the power of knowing, and an affirmation of the human spirit. It’s the kind of thing you might think is too “woo-woo” to be believed, and yet, you’ll find yourself nodding as you read about past lives, ley lines, and energy exchanges. Or at least – I found myself nodding. I don’t think I’m an indigo, but I’ve always been a bit of a misfit, and that common ground, and my love of mystery and folklore, allowed me to find common ground with Dr. Talty. I suspect most readers, especially women, will do the same. I have to confess: Until today, I had never heard of Book Blogger Appreciation Week. I knew more about natural acne treatment than I did about this annual event, and I certainly wasn’t aware there was a whole site dedicated to it. I’m glad I discovered it though, thanks to a comment from Alita of Alita Reads, which led me to her blog, and both the link to BBAW and this meme. As to the meme itself, well, I like doing questionnaires every so often. They’re sort of restful, but sometimes spark interesting tangential thoughts. I’m fairly certain I’ve done this meme before, or at least parts of it, but my answers tend not to be static. I used to read while eating lunch all the time, now, if I snack, it’s usually fruit and/or cheese – non-greasy finger foods. I always have coffee, tea, or water. I’ve never been one to make notes in margins. I think because I generally read so quickly, I’m done before I have time. I’ll dog-ear the pages of books that belong to me, if they’re paperbacks, but with borrowed books, I use bookmarks – I have many – or use a dollar as a bookmark if not. On hardcovers, I do sometimes use the flap of the dust-cover to mark my place, and yes, with my own books, I’m sometimes guilty of laying the book flat, if I’m only getting up for a moment. Both, but more fiction than not. I read across all genres, though I’m not a fan of Westerns or Self-Help, and I love thick novels, mysteries, good science fiction and fantasy, and biographies and memoirs. I prefer my reading matter printed, thank you, and I prefer actual books to ebooks, as well. I like audio dramas, but have never really gotten into audio books. Chapter? Whenever possible – especially if I really LIKE what I’m reading, I finish the entire book! It’s really rare that I can’t figure it out from context – unless it’s in a foreign language I don’t speak. If I’m really stumped, I’ll look it up later. The Lost Symbol, by Dan Brown, and Marley and Me, by John Grogan. Dreaming Anastasia, by Joy Preble. It’s a YA title that seemed interesting when I was at Borders earlier tonight, so I bought it. I usually have one main read, and then another book or two I pick up in between. Generally they are all in different rooms. I’m not sure if this is a sign of good planning, or laziness. The bathtub, but only paperbacks, and only those I own. The couch in my studio, the couch in the living room (generally while Fuzzy is watching something I’m not all that interested in), the toilet (too often for good health), and bed. Both, but lately I’ve been more into series, I think because I like LONG stories, and thick books aren’t trendy right now. I recommend Outside Lies Magic, by John Stilgoe, and The Eight, by Katherine Neville, to almost everyone, and lately have been foisting Christopher Moore novels upon all my friends. My to-be-read stack is under the nightstand on my side of the bed, and on Fuzzy’s dresser, at the moment. And there’s always a stack in the bathroom, too. Completed books these days either go into a bag to be traded to friends, a box to send to my mother in Mexico, a bag to be donated to church, or upstairs. Those that make it into the Word Lounge, are alphabetized by author on my shelves. Reading voraciously may not be the best way to lose belly fat, but it certainly keeps me entertained. While I’m enjoying the Aurora Teagarden mysteries, Christopher Moore’s Fluke which I read earlier this summer is one of the books that I simply couldn’t read fast enough, because it was funny. Buffalo Gal was an August read of mine, and I enjoyed it immensely because it’s so rare to read about a young woman of roughly my age who grew up Unitarian – it’s not a church people seem to grow up in, and that’s sad, because my experience with UU kids I’ve met, and taught in RE, is that they tend to be extraordinarily bright. Right now, I’m trying hard not to read The Lost Symbol, the newest offering from Dan Brown, who – let’s be honest – isn’t the best author on earth, but writes entertaining stories. Why am I trying not to read it? Because I’m not quite done with this fascinating memoir called Indigo Awakening, that I’m expected to review on Friday, and as much as I’m enjoying it, I’ve been waiting for the other book. Just as looking at a jumbled pile of Ferrari parts doesn’t hint at the beauty of a finished car, so, too, does the first novel in a series not really give an adequate picture of the entire collection. 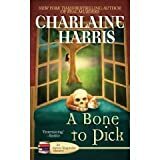 I’ve now finished the second in Charlaine Harris’s Aurora Teagarden series, A Bone to Pick, and while I found the first book enjoyable, I’m much more in love with Roe Teagarden in this second installment. In this book, she inherits a house and a pile of money from her recently-deceased friend Jane, and later finds that she’s inherited a mystery as well. In between dealing with the fact that ex-lover Arthur and his new wife are living across the street from said house (and expecting a baby), and dating the Episcopal priest who performed her mother’s recent marriage ceremony, Roe must also figure out what the mystery is, and why she’s been charged with solving it. As with the first novel, this book is a cozy story, gentle, and homey, and perfect when it’s raining outside, and you don’t feel very well. I bought the book Dove shortly after re-reading Maiden Voyage, because it kept showing up on Amazon’s list of “people who bought this book also liked…” and reading about people going to see on sailing ships is a welcome respite from the world of articles about auto insurance quotes that I generally inhabit. After reading it, I’m a bit disappointed, because it didn’t have the same pull for me that Aeibi’s book did, but overall I thought it was an interesting tale of a young man who didn’t really fit in the conventional world, finding himself on the sea. Where Aebi’s Maiden Voyage happened during a time when she and I were of a similar age, Dove takes place in the late sixties, and there are minor cultural issues – generally the treatment of Polynesian people and culture – that I found a little disturbing. For the most part, however, Dove (which is the name of author Graham’s boat), is a grand adventure, with a bit of nostalgia mixed in.